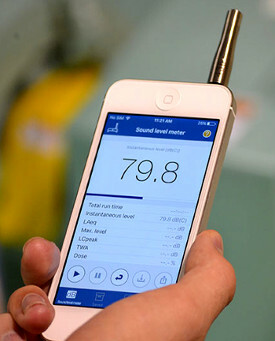 NIOSH HAS DEVELOPED A SOUND LEVEL METER MOBILE APP DESIGNED TO MEASURE NOISE EXPOSURE IN THE WORKPLACE. The app, available for Apple devices, provides noise exposure metrics that are of “importance for proper occupational noise measurements,” NIOSH states in a Jan. 17 blog post. NIOSH is collaborating with other agencies to develop an Android version, but the agency stated that it may verify the app only on selected devices because of the large number of available Android devices and models. The project would begin when funding becomes available. The app supplies instantaneous sound levels in A-weighted, C-weighted or Z-weighted decibels, as well as parameters intended to aid with lowering occupational noise-induced hearing loss. Users can save and share measurement data and receive general information about noise and hearing loss prevention. NIOSH recommends using the app with an external microphone and acoustical calibrator for better accuracy. The app is not intended to be used for compliance or as a substitute to a professional sound level meter or a noise dosimeter, the agency cautions. In 2014, NIOSH researchers examined nearly 200 sound measurement apps. They found that most available apps are designed for the casual user and do not have the accuracy and functionality for occupational noise measurements, according to the blog post.